Leveling your first pet team from 1-25 can be a grind, but dont worry. I've got your back! I have around 251 pets leveled to 25 atm, so I know a thing or two about it. This guide is intended to make your leveling from 1-25 as painless as possible. Its a comprehensive walk-thru including where to start, who to talk to, thier locations, and pet suggestions to defeat them. If your just starting out, please see the Add-ons section of the site to make it even faster! Once you hit 25, switch to the next Guide, "Speed Leveling 1-25" which assumes you already have 2 Gilnaen Ravens, or DMF Crows, and shows you the absolute fastest way to grind out level 25's, not using any trainers or shortcuts. A few things to remember: Unless the pet is lvl 25, the system will divide the XP equaly among the pets in the group. So if you want to get 2 up quickly, try techniques that allow you to use those 2 pets against teams of 2 or 3. Keep in mind as you battle you will come across other pets around the same level, and you want a diversity of these families, so catch a few to diversify your selection when it comes to battling trainers. If your having trouble in an area, check your collection and see if you have pets that are strong against the ones your currently fighting. If your leveling over a period of a few days, each day you can go back and re-fight the trainers form the day before to gain additonal XP, as you recieve alot of xp from trainer fights, and this strategy plays a key role at Higherlevels when your power leveling low pets quickly. Try to stay within 3 levels of each tamers pets. When you get battle stones, dont use them on pets you can find in the wild, instead use them on pets that can be traded. You can always hunt a rare version of wild pets, but most vendors only offer uncomon quality pets. As your working your way from area to area, be sure to stop and fight some of the pets you encounter to raise your levels. Audry Burnhep located at 69,24 in Stormwind City will begin your journey to being a Celestial Tournament Master. She will give you a series of quests that will require you to level a pet to 3, and open your second slot on your pet team. I recomend pets with beast and mechanical abilities. These pets will be strong against the pets your going to face. Old MacDonald, Westfall 60,18 a waits you with Teensy, Clucks, and Foe Reaper 800. His pets are fairly strong, so you might want to get another pet to level. Old MacDonald uses 3 pets, as do all the trainers from here on out. Dont worry about your third slot, you will unlock it once you have leveled a pet to 5. As you make your way to Lindsay, Located in Redridge Mountains 33,52. Her Pets are Dipsy, Flipsy, and Flufftail. Be sure you engage the surrounding pets, you want at least 2 of them level 7. I recommed leveling those 2 first, then bring the third in to tie into the XP. If you need to heal your pets, head over to Lakeshire. Located in the center of Raven Hill, 20,44. Eric Davidson is ready for you. His pets are Blackfang, Darkwidoww, and Webwinder. I recommend having at least one pet at 9, the rest around 8. You can find a stable master in Darkshire. Once Eric is down, get moving to Northern Stranglethorn. Steven Lisbane is standing by with Emerelda, Moonstalker, and Nanners. You should have two lvl 9 pets by now, although lvl 10 is best. Most of these trainers have plenty of pets surrounding them to battle and raise your pets levels. Once youve defeated him, its time to move towards the Cape of Stranglethorn. Bill Buckler is located at 51,73. His pets are Burgle, Eyegouger, and Young Beaky. Two flyers and a humanoid, so you'll want pets with magic abilities that are strong against flyers, around levels 10-12. Once he is defeated you will be able to engage the next set of tamers in the Eastern Kingdom. David Kosse is your first opponent. You can find him at 62,54 East of Skulk Rock. His pets are Corpsefeeder, Plop, and Subject 142. You should have lvl 12-13 pets here. 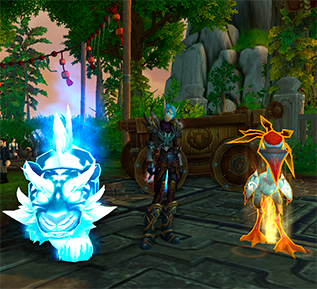 If you need to heal your pets you can find stable masters within Aerie Peak and Stormfeather Outpost. 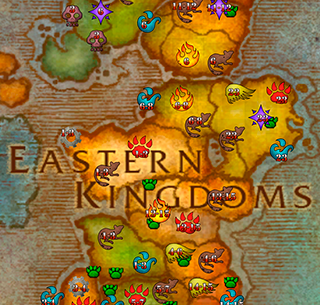 If your pets are around lvl 13 or so, its time to go to Eastern Plaguelands. Deiza Plaguehorn is up next. Bleakspinner, Carrion, and Plaugebringer are fairly simple to beat. She is located at 67,52. Shes west of Light's Hope Chapel and shouldnt give you too much trouble. Mechanicals are strong against beasts. You want one or two lvl 14 pets to make the fight easiest. Kortas Darkhammer is here in the Searing Gorge, and youll find Garnestrasz, Obsidion, and Veridia to be no match for you. Humanoid attacks are strong against Dragonkin. Be sure to have at least two lvl 15 pets before leaving this area, as they will play apart in the Swamp of Sorrows where were going next. Everessa is pretty easy. She is located at 76,41 SE of Marchtide Watch. Her pets are Anklor, Croaker, and Dampwing. The Aquatic pet should go down easily. Lvl 16 pets are ideal here, but 15's should work as well. Your stable master is located inside Bogpaddle and The Harborage. 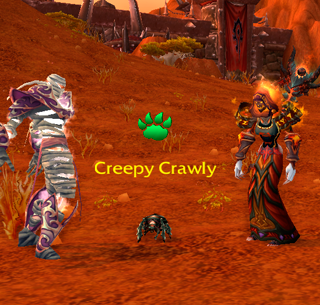 You going to want at least two lvl 16 pets before venturing to Burning Steppes, so grind the local wildlife! Durin Darkhammer is located at 25,47. He has Comet, Ignious, and Moltar for pets. Start by grinding the area untill you have two level 17's. After you defeat him, You should have earned the Taming Eastern Kingdoms. In doing so, you will be able to fight each of the tamers in daily quests to earn Reward Bags. 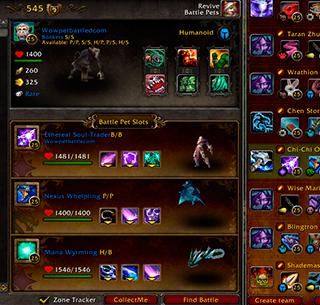 After you have those two lvl 17 pets, we can safely move into Deadwind Pass. Lydia Accoste is going to be the hardest trainer you will come across up to now. She is located near Karazhan 40,76. She has Bishibosh, Jack, and Nightstalker on her team. The diversity in her pets and thier spells can be very daunting, so be sure you have two level 19's and one 20 on your team, and you should defeat her easily. Once shes down, you will complete the Eastern Kingdoms achievement. Now you can battle these tamers in dailies also. I suggest returning to grind them to gain a little Xp boost and start in on your Reward Bags. Nicki Tinytech is first up in Outlands. She's located at 64,50. Her pets are ED-005, Goliath, and Sploder, so break out your elementals and lets get to work! If you need a stablemaster, They can be found in Honor Hold, and Thrallmar. Once you defeat her, stick around and grind two pets to lvl 20. They will help against the next master. Ras'an is on the western side at 17,51. His pets are Fungor, Glitterfly, and Tripod. Your going to need to grind out the local wildlife untill you have two pets at lvl 20 before leaving to Nagrand. The only stablemaster out this far is located in Telredor, which is alliance. Narrok is waiting for you at 61,49. His pets are Dramaticus, Prince Wart , and Stompy. You will need two pets at lvl 20 and one at 21. 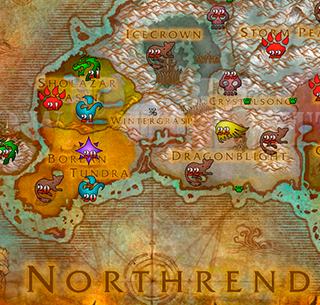 Once hes down, head to Morulu The Elder, located at 59,69 Shattrath. His pets are Chomps, Cragmaw, and Gnasher. You should be able to defeat him with lvl 22 pets, however lvl 23 Flyers are definately the way to go here. 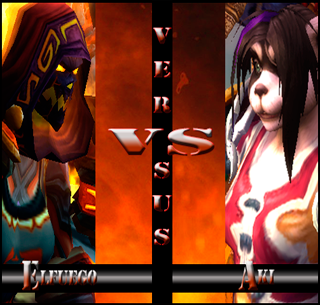 This fight is an insight into powerleveling techniques in Pandaria. Theres a few options you have from here on out. You can visit Northrend, and finish out your leveling, or you can go to Pandaria and start in the Jade Forest. Take a moment to look over the two guides: Northrend or Pandaria. Eventualy you will have to go to Pandaria to finish your achievements and unlock the Beasts of Fable 1 2 3 dailies and the Pandren Spirits. So I recomend going to Northrend and defeating the trainers there, and picking up some of the more exotic pets like the Scourged Whelpling. They are Nearly Headless Jacob, Gutretch, Beegle Blastfuse, Okrut Dragonwaste, and Major Payne. You should find them to be relatively easy. 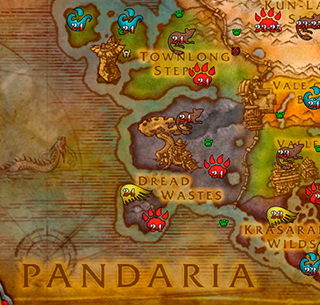 Once complete, make your way to Pandaria.